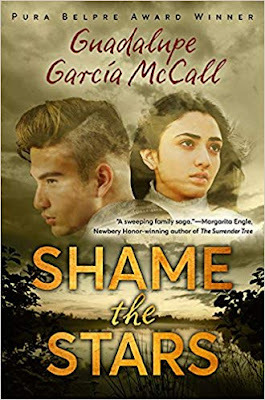 As the Mexican Revolution rages across the border, Joaquín del Toro, the son of a wealthy Tejano rancher, dreams of taking over his father’s land and raising his family with his beloved Dulceña Villa, the daughter of a newspaper publisher. But a satiric poem in the newspaper—condemning the racism, violence, and general lawlessness of the notorious Texas Rangers—drives a wedge between the two families. The del Toros and the Villas agree that the Rangers are threatening their community, which has lived on this land before it was violently snatched from Mexico in the 1830s, but Joaquín’s father wants to negotiate with and appease the Anglos in power (hoping that local authorities will restrain the paramilitary Rangers) while, by means of the newspaper and the enigmatic opinion writer La Estrella, Dulceña’s father urges the Tejano residents to rise up and defend themselves. Shame the Stars takes its inspiration from Shakespeare’s classic Romeo and Juliet, and like the original, this dispute between families is essentially a political one. In the first chapter, Joaquín’s father bans the entire Villa family from the ranch because of the newspaper’s incendiary articles and editorials. Joaquín must resort to sneaking out to masquerade balls and nighttime meetings in the woods—where coming into contact with Rangers is a constant peril. Ultimately, though, the families come together as Joaquín’s father realizes that the Rangers don’t want to negotiate but kill Tejanos, take their land, and drive the shattered survivors over the border to Mexico—and the elected and appointed authorities cannot or will not stop the vigilantes. While Joaquín and Dulceña’s families now face a common enemy, they don’t want their only children in the middle. Readers come to understand the necessity of self-defense and the dilemmas Tejanos faced when confronted with a far more powerful and violent opponent, dilemmas that have become relevant again today on the border and elsewhere in the United States. McCall captures a history of cruelty and vigilantism that has been hidden from most young people (including those growing up in Texas). Her multi-dimensional teenage characters and the love between them will draw readers in and personalize the history. The family saga continues, one generation later, in McCall’s 2018 novel, All the Stars Denied. Highly recommended.